Two very different ways to unweight the skis, defined in terms of how the body's mass is impulsed: up or down. The unweighting of the skis was important with the older straight skis, which needed to be unweighted to be pivoted into the new turn. These days, althugh some still use the old "unweight and pivot" techniques, unweighting is generally used as a way to help release the edges and help initiate the new turn, and referred to as Extension release++ vs Flexed release. One thing to pay attention to, when judging either is that, depending on the performance of the turn, the hips will generally rise no matter which is used, because the body keeps moving forward somewhat, while the skis follow the slope downwards - see more at the Retraction release. So, when looking at a skier releasing, it is better to look for extending (longer) legs, or legs that stay the same, or legs that get short (flexing), to determine how the body is impulsed. There is a large spectrum of unweighting, between pushing hard on the skis at the end of the turn to throw the body upwards, versus a complete flexing and relaxing of the legs, to allow it to fall downwards. Impulsing "up" may be not just a result of a forceful pushing to release but also the result of just waiting with a strong leg: as the skis come around the turn, the body will get a jolt up and it is the same end result as if we actively pushed. 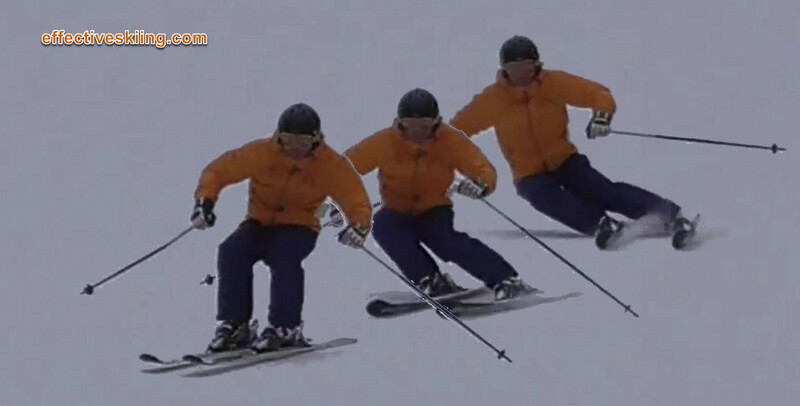 You often see extreme cases of this long leg at the end of the turn and it's commonly referred to as "jamming" at the end of the turn, where the hips are blocked by the legs while the torso keeps moving down and the skier hunches forward. See release and flexed release. Viewed 1704 times ( | Print ) this page.